Bollywood music has never really crossed over into the film music mainstream, despite being an enormous industry on the Indian sub-continent; the closest Bollywood has to a composer superstar is A.R. Rahman, so it perhaps stands to reason that he should really be the first one to make any kind of impact on the Hollywood mainstream. Rahman has worked in the Indian film industry since the early 1990s, and has since gone on to score over 100 films, some of which – Taal from 1999, Lagaan from 2001, Rang De Basanti from 2006, and Jodhaa Akbar from earlier this year – have enjoyed a modicum of international success. He has even dabbled in the Hollywood world before, working with Mychael Danna on Water in 2006 and with Craig Armstrong on Elizabeth: The Golden Age in 2007. In his homeland, however, Rahman is revered: he has personally sold 100 million records of his film scores and soundtracks worldwide, and sold over 200 million solo albums, officially making him one of the world’s all-time top selling recording artists. No wonder he is often called the “John Williams of Bollywood” and the “Mozart of Madras”. It’s just surprising that it has taken this long for the West to recognize him. It’s perhaps not surprising that Slumdog Millionaire has become his international breakthrough; it is 2008’s ‘little film that could’, the unexpected beneficiary of America’s sudden infatuation of the culture and music of India, in much the same way as Crouching Tiger Hidden Dragon became the poster child for the wuxia film, despite there having been dozens of other, better films preceding it that did not benefit from the international backing of a Hollywood studio. However, Slumdog Millionaire is a Bollywood movie with a difference – for a start it’s directed by an Englishman, Danny Boyle, and is written by the man who wrote The Full Monty, Simon Beaufoy. But other than those unconventional elements, it’s otherwise one of the feel-good rags-to-riches tales that play so well in Indian theaters. Dev Patel stars as Jamal Malik, a boy born and raised in the slums of Bombay who, through a combination of hard work and good fortune, wins a chance to be on the Indian version of Who Wants to Be a Millionaire. His appearance on the programme brings him into contact with his long-lost girlfriend Latika (Frieda Pinto), and it is from their unexpected re-connection that the story of Jamal’s life unfolds. Boyle’s instructed Rahman to make his music “pulsey”, and to have an “edgy, upfront” style that reflected modern, urban India; as such, Rahman’s songs and score have an excellent blending of the traditional Bollywood sound with urban dance beats and electronica, which makes for a surprisingly engaging listen. Rahman’s three score tracks are “Riots”, “Mausam and Escape” and “Latika’s Theme”; the former is a brief atmosphere cue with a strong electronic undercurrent, while the latter is a more traditional melodic piece featuring a softly strumming guitar, a mellower synth beat, and wordless vocals by Suzanne D’Mello, which later goes on to form the basis of the lovely English-language song “Dreams on Fire”. The standout, however, is “Mausam and Escape”, which is actually quite wonderful, building from a guitar/sitar duet to encompass a full orchestra, and eventually even a choir, with a superb, intoxicating electronic rhythmic undercurrent. It’s certainly not your typical piece of film score, but there is something intangibly engaging about the cue which captured me the first moment I heard it. The original songs, all but three of which were written by Rahman in collaboration with various lyricists, make use of a number of popular Bollywood playback artists, and are generally very good. The best songs are the opening “O Saya”, a euphoric, percussion-heavy piece than can be best categorized as Hindi trance music; “Ringa Ringa”, a mesmerizing vocal combo which pits Alka Yagnik’s cat-like high pitch against Ila Arun’s deeper, orgasmic-sounding smokiness; and the exhilarating, crowd-pleasing “Jai Ho”, which features Punjabi superstar Sukhwinder Singh, and gradually builds into a wonderfully invigorating, uplifting celebration of Bollywood clichés that is quite captivating. Both “O Saya” and “Jai Ho” have been nominated for Best Original Song at the 2008 Academy Awards. Of the songs which Rahman didn’t write, “Aaj Ki Raat” comes from the 2006 film ‘Don’, and was written by the composing trio Shankar- Ehsaan-Loy in a style which sounds like a refugee a Donna Summer 1970s disco track, while the only slight misfires are the two “Paper Planes” pieces, which were written by the Anglo-Tamil hip-hop artist Mathangi Arulpragasam (aka MIA). MIA was recommended specifically to Rahman by Boyle for the film, but I found her gangsta-wannabe vocals and prominent south London accent more annoying than anything else. The controversy surrounding Slumdog Millionaire is twofold. 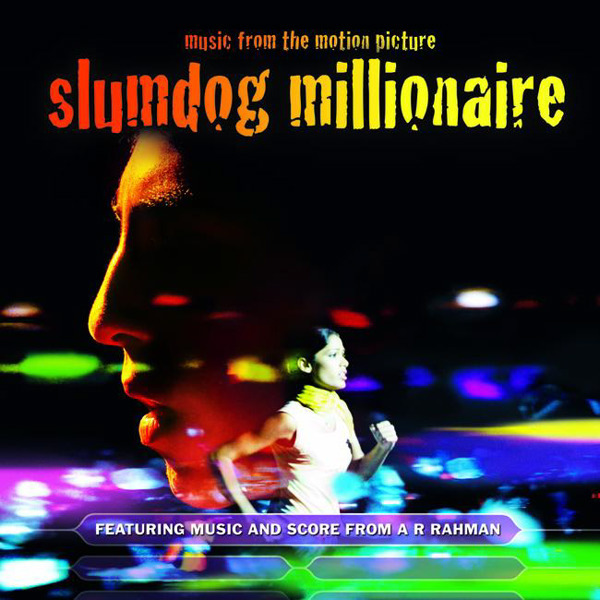 Firstly, devotees of Bollywood music have explicitly stated that Slumdog Millionaire is a minor effort compared to Rahman’s other scores, and that its success is merely a fleeting flash-in-the-pan tied solely to the popularity of the film, and is in no way indicative of the actual music Rahman usually creates. This undeserved ‘flavor of the month’ tag is also directly linked to the second issue – Rahman’s multiple award wins and nominations from the Hollywood mainstream, and the fact that he is likely to win two Oscars at the 2008 Academy Awards, at the expense of (arguably) more deserving candidates such as Alexandre Desplat, Danny Elfman and James Newton Howard, and which has left mainstream film score fans wringing their hands and gnashing their teeth in frustration. Personally, I’m quite torn by the whole thing. When I listen to the album, I find myself enjoying it considerably, songs and all, although part of this could be attributed to my familiarity with Indian music in general (due to where I grew up in northern England), and my increasing appreciation for its stylistics and conventions. On the other hand, anyone who does not have this link to the style, however, is likely to find large parts of the score intolerable at worst, and a slightly annoying curio at best, which makes recommending it difficult. It certainly doesn’t deserve to win Best Score, but it’s also certainly much, much better than much of the mainstream film music community has been led to believe. Music composed and arranged by A.R. Rahman. Recorded and mixed by Andy Richards. Edited by Niv Adiri. Album produced by A.R. Rahman.